It is the end of the 20th century. A worldwide economic recession wreaks havoc with the nation and the planet. The impending threat of anarchy has given rise to a secret vice organization called 'Crime Ghost.' Dangerously poised to take over the world with its diabolic strategy, 'Crime Ghost' has infiltrated every country simultaneously. There is one President who has initiated a plan to wipe out the association, but now his home has been attacked and his daughter Elise abducted. A letter has arrived demanding that he resign his powerful position within a number of days, or else his beautiful Elise will be executed in a most unpleasant manner. The letter is signed 'Faust, the notorious mastermind of Crime Ghost. The president knows to whom he must turn. The President has summoned two men known as Paul and Vince, the incredible Ikari Warriors. Now, YOU become Paul and Vince. You must go to the enemy hideout, rescue the lovely Elise, fight Crime Ghost, and destroy them all. To do this, you will use your undersea scuba tactics; your guerrilla fighting power with machine guns and grenades; and your own brute strength, together with your superior Martial Arts skills, performing kicks, round-house kicks, jump kicks, punches, and more. 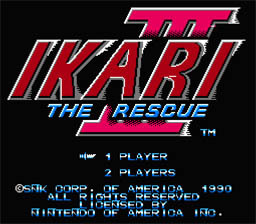 Ikari Warriors, save the world from chaos! Now! --From the NES Ikari Warriors 3 instruction manual. Play Ikari Warriors 3 Now! Save the president's daughter from the evil organization that has kidnapped her. Not much of a plot, but there it is. These games weren't about that, just an excuse to kill everything in sight. Ikari Warriors 3 was not that bad of a game, unlike its predecessors. This edition had a good many improvements. The graphics were a great deal better. The backgrounds looked better and the characters were well drawn. Also, the controls were a little more responsive. Ikari Warriors 3 was probably the best Ikari Warriors of its time. If you like Ikari Warriors, you'll love this one! One big improvement for the controls was the ability to jump. If you press A and B at the same time, you will perform a jump kick. This is very good for dodging enemy fire. The only thing I didn't like about the game was the fact that for most of the game you don't have any weapons. You only get weapons during a boss battle, and sometimes you can find them on the ground, but they are limited. Be sure to use weapons wisely when you find them, for they are sparse.